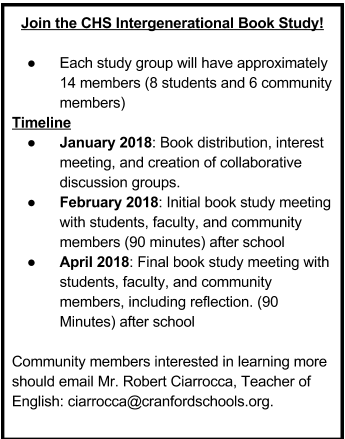 Cranford High School is inviting community members to join a book discussion group with students in early 2018, after receiving a grant from the Cranford Fund for Educational Excellence (CFEE). The project will provide the opportunity and choice for students, staff, and intergenerational community members to read and discuss stories of individuals confronted with limitations that stem from racial, socioeconomic, physical, and gender issues. Members of the student-led book study group will formally meet twice after school to discuss and reflect on the text, making real-world connections with members of the community. The Cranford Public Library will be partnering to publicize the program and recruit community members as well. As part of the CFEE-funded program, students and the self-selected community participants will each receive a copy of their assigned book and a journal for recording notes and impressions leading up to discussion. For community members, participation in the project is a low investment of time with a potentially fruitful return. “Not only will community members enjoy reading and discussing an excellent story, our hope is also that through these kinds of experiences, the community at large can become more personally invested in the school systems and in the lives of our students individually,” CHS English Teacher Robert Ciarrocca said. Cranford High School Principal, Mr. Mark Cantagallo is fully supportive of the new project. “This type of activity focuses on community and lifelong learning while putting students in leadership positions and opening our doors to the public to show them how great this school is, right in their town,” Cantagallo said. Community members interested in participating should email Mr. Robert Ciarrocca, Teacher of English: ciarrocca@cranfordschools.org by December 1, 2017. Pictured: Four of the five non-fiction books selected for the flagship community book study at CHS. Click here for a brief video.